Maybe the cracks and weaknesses of the band had started to show in 1974. There were already rumblings amongst the press that the band were going stale and that taking so much time away from their fans whilst filming the movie 'Flame' was affecting their popularity and fan base. Slade were to make the mistakes in 1975 that were to signal the beginning of their spectacular fall from grace that would render them rock nonentities in just two years. Rightly or wrongly, Slade were to pin their plan for the year on the film Flame being a success. That success and a short UK tour as well as three singles would suffice enough for the fanbase as they made the decision and announced that they would not be touring in the UK and Europe for the forseeable future as they intended to concentrate on the American market.That perennial problem, their inability to achieve any real tangible success there was now being placed at the top of manager Chandler's 'To Do' list. If you throw enough mud at the wall, some of it will stick seemed to be the band's mantra regarding America and their proposed sixth US tour was seen as a make or break trip. Hopefully their change of record company in the US from Polydor to Warner Brothers as well as a few US agency changes would reap rewards. That was for the future, the start of the year saw them out and about busily promoting 'Flame' as it neared a general release following it's premiere in Newcastle, Chandler's home town. The film was met with muted appreciation from the critics, no one really raved about it and no one really crucified them for it, it wasn't the success the band had hoped for critically or financially and was quickly withdrawn from circulation once the initial release run had been completed. The band had decided that they wanted to record their next LP in the States, which meant that there was no likliehood that there would be an LP release for the year. Despite Flame having slipped out of the LP charts with disappointing sales, the band decided, due to 'public demand' to release the title soundtrack from the film as their next single. 'How Does It Feel' remains a firm favourite of many fans and non fans alike, a timeless classic and arguably Slade's finest track from a career littered with fine tracks. Despite several TV appearances promoting the single it failed to light up the imagination of the record buying public and became the first single release for some considerable time to not make the Nation's Top 10. Slade embarked on their final 13 date UK tour in April with Bunny, another of manager Chandler's charges, taking up the support duties as they had done on the band's tour of Scandinavia the year before. As tours go it was considered a success as usual, but the knives were out for the band and more than one influential music mag were writing Slade off as they reported from the various gigs, the writing was on the wall, and maybe for us fans it was barely perceptible at the time. The band left for America and from then on it was nigh on impossible for fans to find out what was happening there, periodically there would be a newspaper report pretty much saying the same things as had been said year after year...good shows, picking up record sales...playing to big crowds...slaying the States...yadda yadda yadda ...same ol' same ol'. They released the follow up to 'How Does It feel' at the conclusion of their UK tour and 'Thanks For The Memory', while making the Top 10 didn't stay long on the chart. Their third and final single of the year 'In For A Penny' charted slowly and just failed to make the Top 10 making 1975 the worst year for record sales since the band hit the big time. By the time 'Penny' was released the band had been gone too long from these shores, the only good thing to happen once they had departed for the States was that the BBC broadcast a two part radio documentary in August that had been recorded during the bands spring UK tour. 'Insight' , a short lived radio series kicked off its run with part one of the documentary 'Six Days On The Road', a behind the scenes look with the band and featuring something new, the title track, which later appeared with a different lyric as 'When The Chips Are Down'. 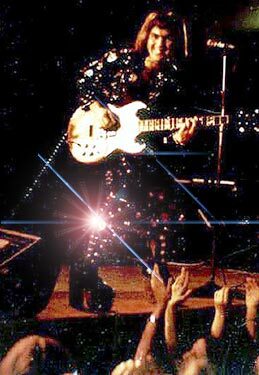 The following week part two was transmitted which consisted of an edited concert recorded at the second of their two New Victoria Theatre shows....it was something, but not much for the Slade starved fans, many of whom were starting to move onto something more readily available. All chart positions refer to UK national Charts unless otherwise stated.